Chicken joy is I think the most popular fried chicken in the Philippines. Not just the taste that captured the palate of Pinoys but also the crispy chicken skin and the aroma is what makes it number one. Since the original recipe is top secret, who knows what is the real recipe? There are many chicken joy recipes you can find but most of them have a lot of ingredients that I think might spoil the dish. 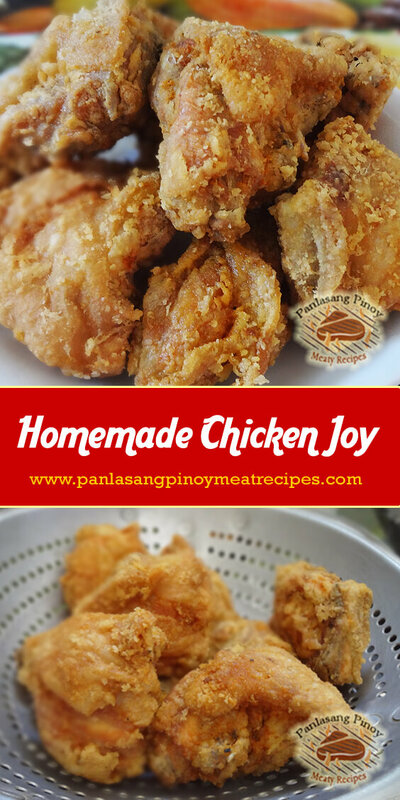 The great thing about this homemade chicken joy recipe here is the simplicity. Sometimes simple ingredients makes the dishes tastier. When preparing the chicken, to avoid the crispy tasty outside and bloody raw inside, prick each chicken until it reach the bones with a bamboo stick or a toothpick 3 to 5 times before frying it. And if you can’t find five spice powder, you can make your own by combining equal amounts of ground anise, ground black peppercorns, ground cinnamon, ground cloves and ground fennel seeds. Mix them thoroughly or shake them in a bottle until well mixed. Make sure you don’t use too much five spice powder, start using only 1/4 teaspoon. If that is not enough for your taste, then make it 1/2 teaspoon. Too much of it will ruin the taste. Chicken joy is I think the most popular fried chicken in the Philippines. Not just the taste that captured the palate of Pinoys but also the crispy chicken skin and the aroma is what makes it number one. Just don't overcrowd the fryer to avoid the fried chicken to become soggy and loose it's crispiness. Hi, just follow the yellow arrow above that says “Download now! Click here!” and submit your email then follow the procedure on how to get your ebook. Hi Sir! I was just wondering po if iba iba po ba yung timpla ng mg store bought five spice powder? Kasi po I tried your technique! Okay naman po sa texture pero problem ko po is di ko po sure kung ito po ba dapat lasa (masarap naman po pero parang di malapit sa jollibee). Is the taste po ba nung expected fried chicken niyo is medyo malasa nung sa jollibee? Baka po kasi nasa five spice ko po baka iba yung timpla! Love your posts sir lalo na yung kare kare! I think the store bought spice powder is different from the homemade one. Try the store bought spice powder and experiment. 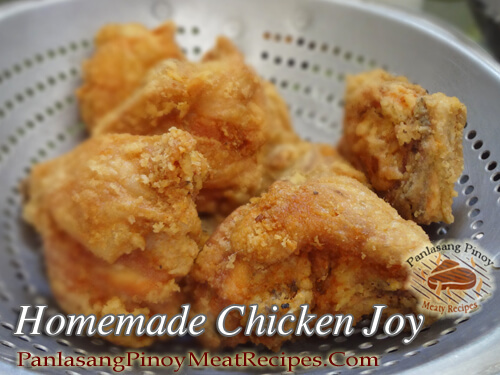 Honestly this is not the exact recipe of chicken joy because that is their trade secret. This is just an imitation. Hi Ken,When i fried a chicken i used egg yolk ,fresh milk,corn starch,flour,salt and pepper,and little bit of brown sugar, five spice powder,powdered chicken broth.The same procedure as of Benjo’s,Just try it okay? Hi sir! I’m a big fan of PanlasangPinoy Recipes. I was afryman in Jollibee before pero hindi ko alam ang secret recipes nila kaya ako napadpad dito. I understand this recipe is just the immitation of original recipe, I’m just wondering if I can use a typical pressure cooker na ginagamit sa bahay to cook this? I’ll wait for your response! Thank you! Never use an ordinary pressure cooker for frying. It’s very dangerous. The reason is, the temperature of boiling oil is higher than water which will melt the gasket. The pressure cooker might burst. Yes you can’t use the ordinary pressure cooker to fry your chicken. Better use a frying pan. Thanks Linda for your comment. Can I bake the chicken in the oven instead of deep frying? Thanks. Yes you can bake it in the oven. You need a baking dish and put some oil in it. Then put the breaded chicken on the baking dish and bake it in a preheated oven 350°F for 30 minutes. Then turn pieces over and bake for another 30 minutes. Hi Enrico, I think you can use the air fryer because the concept of cooking is like baking. You can also bake this chicken recipe. I’m not sure what will happen if you use rice flour but I think rice flour is used in making Korean fried chicken. This recipe is using all-purpose flour which is wheat flour. Hi Yvaine, using premix breading like a spicy breading will not be the same as the ingredients in this recipe. I noticed that you are using egg yolk and fresh milk in your ingredients. How many egg yolks are used and how much fresh milk shall we add? Hi Mayette, there is no egg yolk or fresh milk listed on the recipe. Do you have the recipe for the gravies? Hi Xer, as of now I don’t have any recipe for the gravy. Maybe soon I’ll include it in this recipe. I don’t have all purpose flour is it okay to use only starch? Hi Meatrice, you can use cornstarch instead of flour. Hi Sharina, it depends on your preference. But you can start on 1 tsp of salt per kilo..